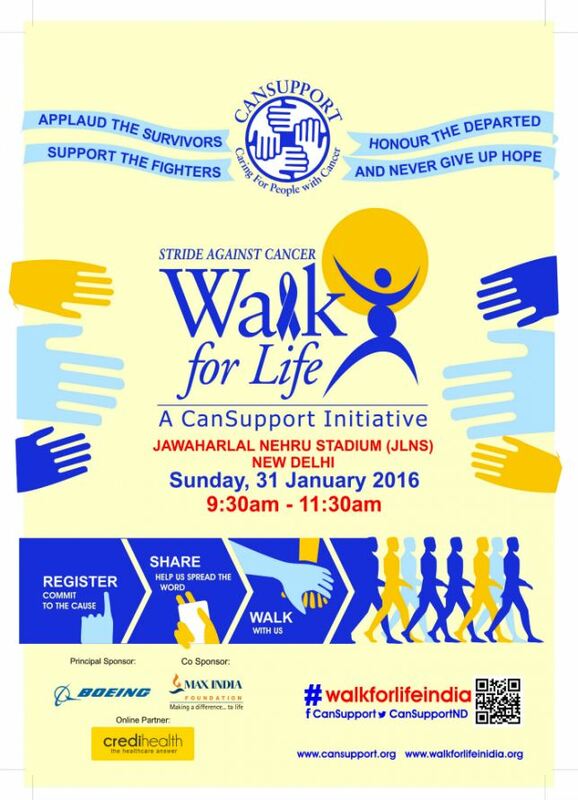 GURGAON, India - Jan. 9, 2016 - PRLog -- Credihealth is now the official online partner of CanSupport’s much awaited annual walk for life on Sunday 31st January 2016 at Jawaharlal Nehru Stadium in New Delhi, India. The aim of the walk is to provide a commonplace for people battling cancer and families of cancer patients to come together and promote cancer awareness. In addition to this, this event’s purpose is to bring light to it’s free of charge palliative services. Registration for individuals at the event is Rs. 300 and for students it is for Rs. 200. Every person who registers gets a T-shirt to wear on the day of the walk. Credihealth will be covering this event on all social media channels. Palliative care is as essential as medical care since it provides patients mental comfort, spiritual relief and social support. These are some of the many key points of palliative care. A recent study revealed that there are more than million new cancer cases every year, but not enough palliative care centres to provide counseling and care to patients suffering from the Big C. Out of this number more than half of the people die due to late detection of cancer. The fact of the matter is that there are more number of patient who require palliative care than those who require treatment. Unfortunately, there are only 200 palliative care centres across India - this number is nowhere close to being enough. Not just that, most of these centres are located in cities making it even more difficult for people residing in rural areas to receive care. A majority of people are extremely weak and require additional care to make them comfortable. With this event, Credihealth aims to create awareness about the Walk for Life across the cities and neighbouring regions. CanSupport and Credihealth expect a huge amount of people to join them for this noble cause. About CanSupport: Established in 1996, CanSupport helps cancer patients by providing them palliative care. The organization was founded by Harmala Gupta who is a cancer survivor herself. She is also a part of the Indian Association of Palliative Care (IAPC). About Credihealth: Every family has a healthcare problem. Credihealth is addressing the 'where to go for treatment' issue. It is a platform which allows a patient to compare and select doctors, hospitals, treatments and cost options from the comfort of his home. Currently, Credihealth has the largest network of hospitals in the country, having signed up with over 500 hospitals including the marquee hospitals like Max Healthcare, Fortis Healthcare, Global Hospitals, Apollo Hospitals, Manipal Hospitals, Narayana Health, etc.